This is a highly individualized treatment option that is gaining very rapid and wide spread acceptance. It is a treatment that incorporates various branches of Dentistry in a harmonious and interactive manner to give the patient a fully functioning mouth and excellent oral health that can last for decades. It is very common to see patients mostly elderly having many missing, broken and decayed teeth, faulty gums, small individual faulty prosthesis that have become obsolete and who are always in some sort of Dental pain, who are unable to eat hard food stuff, whose oral musculature has shrunk, who are unable to lead a normal healthy life and have resigned to this fate. But not anymore, we at S.V.D.C. using the latest treatment options, more than 50 years of experience and having treated more than 3 Lakh patients are also the pioneers for Full Mouth Rehabilitation. Combination of various Dental fields and treatment options that fit into one individual customized treatment plan to enable a person who out of neglect, age or medical conditions has a barrage of continuous, interlinked dental problems that affect the way they eat, drink, look and feel. Periodontics: Treatments like scaling, Curettage and Root Planeing are performed to make sure the gingival conditions improve and that the gums and surrounding tissues are strong enough to receive prosthesis. Endodontics: Teeth with cavities are restored, teeth with Peri Apical Abscess (Pulp involvement) are endodontically treated (either Root Canal Treatment or Pulpotomy) and grossly decayed teeth are treated with Apicectomy and Root Amputation. Surgical Aspect: Severely compromised teeth might be extracted, ill-fitting prosthesis may be surgically removed. Implants: Implants might be placed in long continuous edentulous spaces to provide support for further prosthesis. 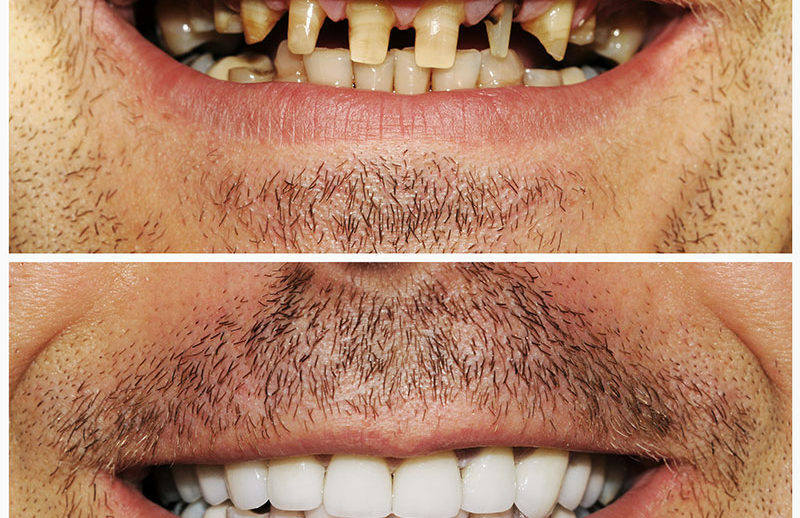 Crowns/ Bridges: Once the gums are rectified, teeth restored, the final step is prepared each jaw (every tooth present in that jaw) to receive a bridge/ Fixed Partial Denture. Ideally in Full Mouth Rehabilitation, we do one jaw (either upper or lower) at a time, usually starting with the jaw having the bigger problems. The Biggest advantage is being able to lead a healthy life, free of Dental pain and inability to eat what you like. Due to Full Mouth Rehabilitation, a person’s masticatory abilities improve aiding in better digestion and preventing medical problems like acidity that can lead to chronic peptic ulcers. Time Factor: Since the treatment is discussed and prepared with such precision and individualistic approach, years and years of Dental health neglect are treated and tackled in a matter of few weeks. Patients who lost teeth early in life need not feel left out, they can have the same confidence of having a healthy mouth full of teeth in no time. The associated muscular dystrophy (sagging cheeks) are also rectified giving a much younger appearance. In short, Full Mouth Rehabilitation is a boon for people who out of neglect, old-age or diseases live with fear and apprehension regarding their dental health and be prepared to lead the same good quality life that they used to earlier and leave the past dental problems to us. For more details Book an Appointment.